Designed for a young professional couple with a growing family who plan to live in their home for many years to come, individually customized elements infuse this kitchen with personal expression. The existing space had some elements the couple appreciated and wanted to preserve but it needed significant transformation to achieve the fresh and rustic Mid-Century Modern feeling they desired. They wanted an open and light-filled kitchen connected to scenic natural surroundings and accommodating for an active family life. Upper cabinetry blocked ocean views while the awkwardly placed island and appliances made the space feel cramped and difficult to navigate. 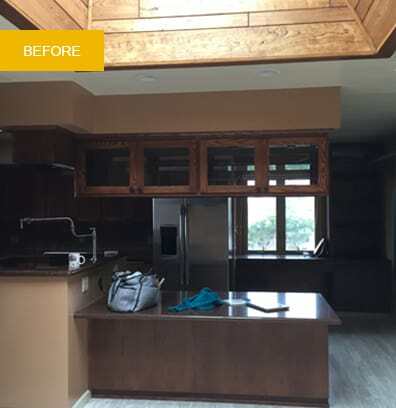 A dramatic transformation started by removing the upper cabinetry and completely redesigning the space planning of the kitchen for unobstructed views, emphasized by new corner windows. The meticulously designed tile backsplash was a joyful collaboration between designer and client. 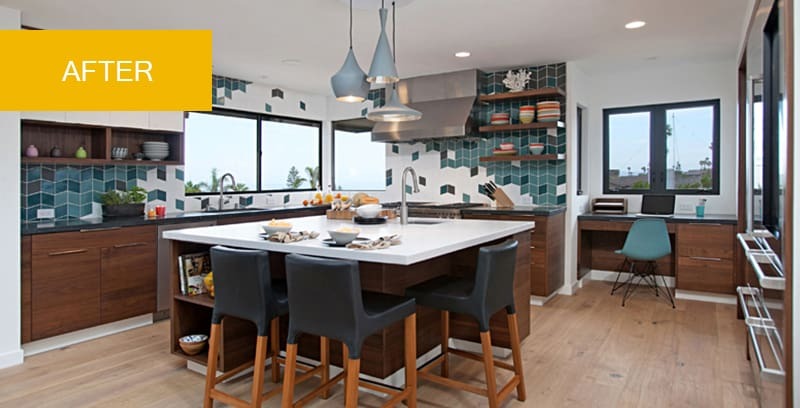 Now open and integrated, the kitchen, dining, and living space welcome cooking and entertaining with ease and style. Natural woods, rustic elements, and bright white surfaces bring an original interpretation to Mid-Century Modern style.